I have a love affair with world cuisine in general. I drool over delicate European pastries. I sigh in delight at the sight of earthy stews from Eastern Europe. I am fork ready for an Australian BBQ. African, South American, Indian, Asian and Middle-Eastern are just some of the keywords that bring up images of delicious foods in my mind. 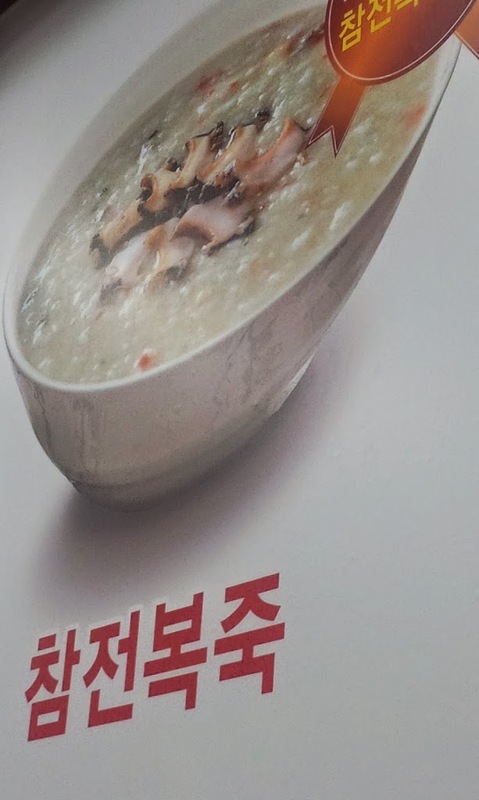 I think you get the point: I love trying food… Which is why it goes without saying that South Korea, with its healthy (and sometimes not so healthy) dishes, had me most excited to dig in. In the following post, I give you a quick tour of some of my favorites! But, first thing first, the chopsticks! You might think you are a pro with them, but you should know that Korean chopsticks are a bit particular in the sense that they are actually flat. It takes a bit of adaptation to actually get the hang of them! However, when you are used to them, it seems like balancing precious rice grains becomes much easier. Next, most meals I had in Korea came with complementary appetizers. 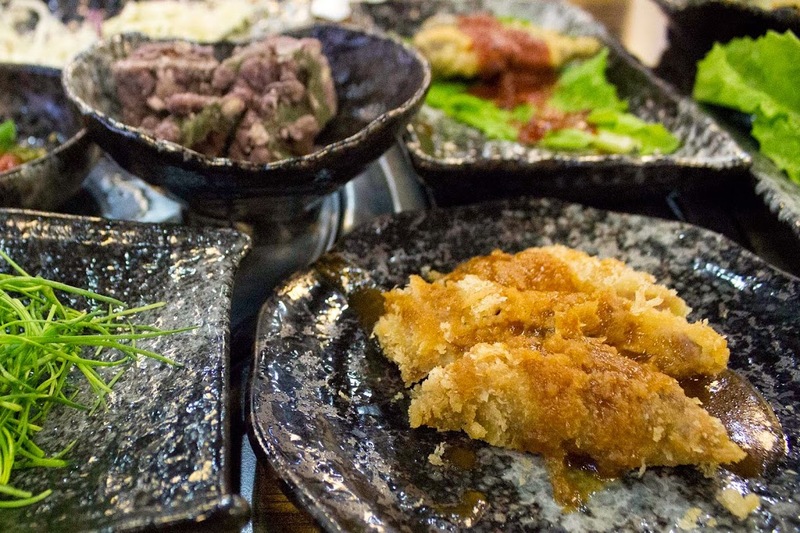 In most cases, it was a simple plate of kimchi, one of the staples of Korean cuisine. Other times, it was a combination of pickled goods. In this way, it really made me think of the pickled condiments you sometimes get at the center of your table during a traditional Quebec dinner. Other times, the table got filled with numerous little dishes each neatly lined up. Finishing them could quickly become a daunting task if you were aiming at leaving nothing behind! 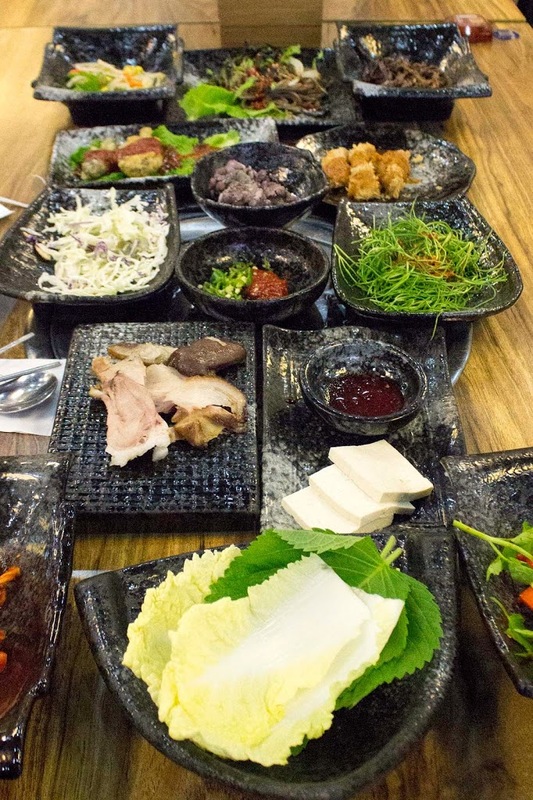 However, I suspect they wouldn’t normally all be consumed by a single person as it is custom in Korea to share food among a group by putting everything in the center. So maybe the staff was too generous by serving me their habitual portions or I was too ambitious by aiming for the finish line. Lastly, but nonetheless an important detail, I was impressed by the delivery culture here. It seems you can pretty much have anything delivered. While I have not personally witnessed it (for lack of ability of being understood when I tried to order food by phone), I have been told that some places would even deliver and come pick up plates and cutlery after. It seems so unlikely to me, that I can’t help but wonder: is this an urban legend? Ah, the kimchi – the national Korean dish. This traditional side dish is made out of seasoned vegetables that are fermented, sometimes for months. There are hundreds of varieties of kimchi, but the one I have seen most often was made out of napa cabbage and spices. Red chili, now a common ingredient for kimchi, was really only introduced to Korea after the Japanese invasion at the end of the 1500s. 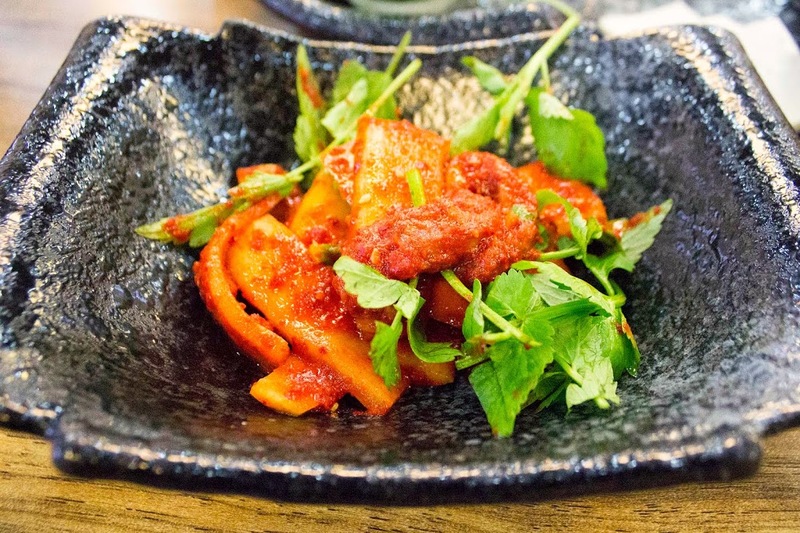 I have rarely seen a dish that defines so much a country – kimchi reflects the seasons and the regions and is deeply rooted in the history of the country. In Seoul, there is even a Kimchi Museum which, sadly, was closed for funding reasons during my visit. Dolsot bimbimbap was the first dish I had in Seoul. It is a dish I much liked at a Korean restaurant back home (recommended by a friend who spent time in South Korea) and it seems that the restaurant in Ottawa really serves authentic food. The main ingredients are rice, seasoned beef, shiitake mushrooms, fernbrake (a Korean green high in protein), carrots, zucchini, bean sprouts, spinach and egg. There is a slight difference between bimbimbap and dolsot bimbimbap. In dolsot bimbimbap, the dish is served in a heated stone pot that sears the rice grains and makes a yummy crust at the bottom. 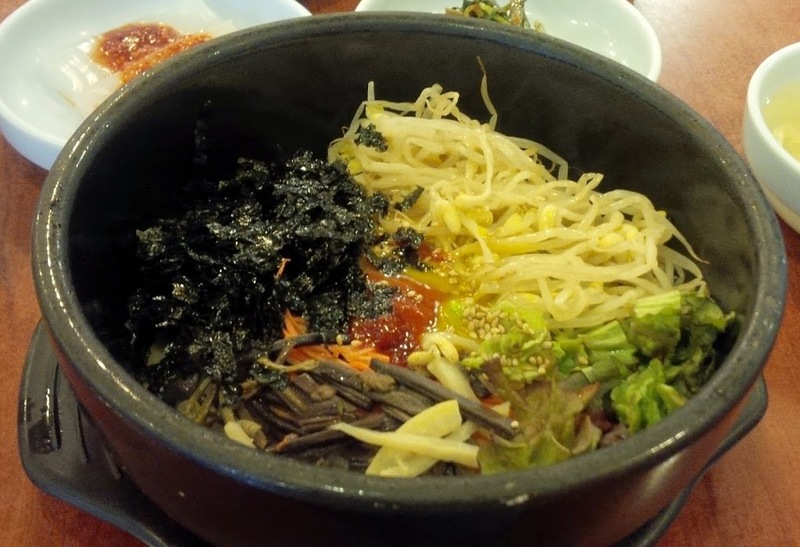 Depending where you are, dolsot bimbimbap can be harder to find. Sadly, which really isn’t so bad, bimbimbap was often the only thing I could order when I failed to be understood. So it happened quite a few times that I wanted to try something new, but just couldn’t. 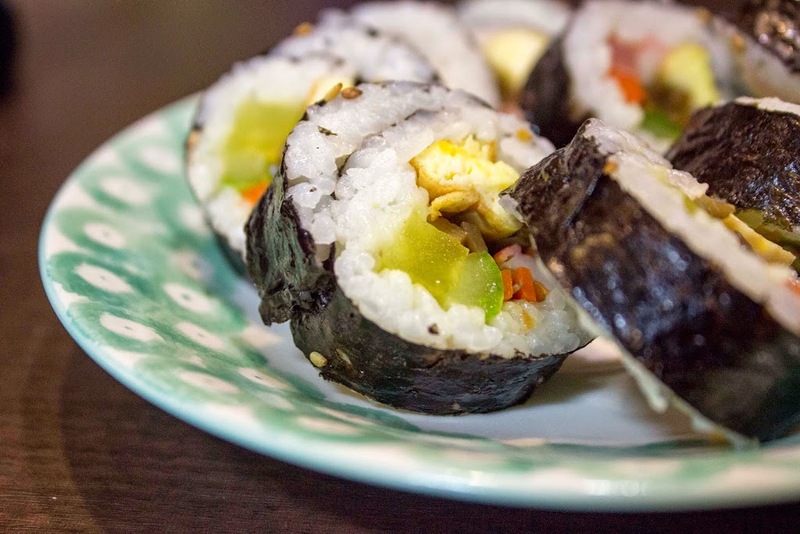 The Korean version of rolls and quite delicious in itself. They can be made of various ingredients, but the most common combination seems to be rice, vegetables, pickled radishes, egg and pork. 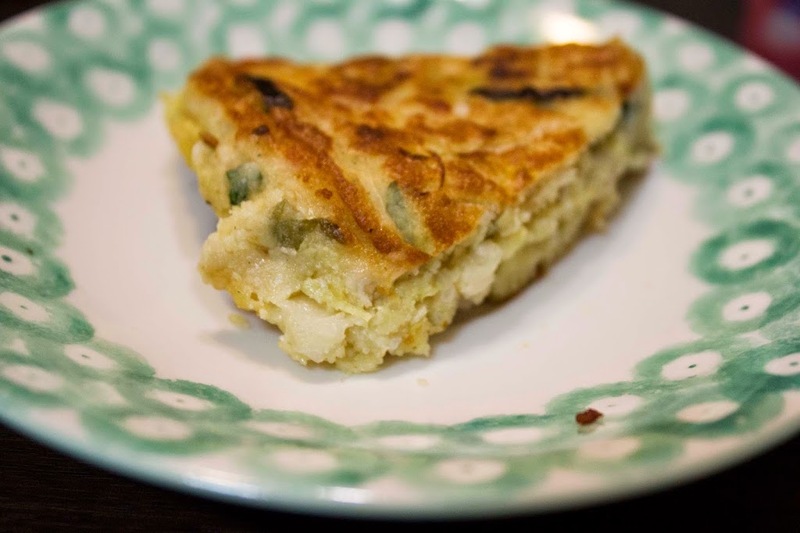 This pancake type of dish is primarily made out of eggs, flour and green onions. More fancy versions can contain various additional ingredients, including different vegetables, seafood, beef and pork. A porridge made of rice and grains. It is a health food and is considered specially beneficial when you are fighting illness. It comes in a myriad of ways, from plain to seasoned with vegetables, nuts and seafood. 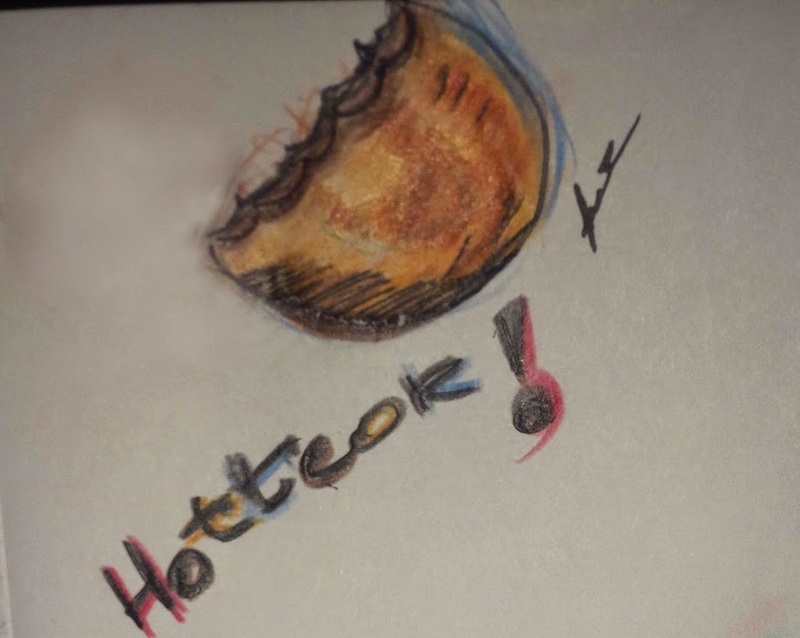 I had this twice, once a jeonbokjuk made with abalone in Busan and another time a miyeok juk made with seaweeds on Jeju Island. Bulgogi is another food I had the opportunity to taste prior to going to Korea in a small restaurant in Ottawa. It is a delicious dish made by grilling thin slices of marinated beef. My roommate Diana took me once to try a barbecue restaurant that served bulgogi meat which you could grill yourself on a hot plate at your table. It came in 8 different marinades, with mushrooms and other vegetables for grilling. Once your grilling was done, you would take a lettuce or other green leaf and wrap the content in it. It is a dining experience I highly recommend! For those who would not know what this is, it’s a noodle soup in a meat or fish broth, with miso or soy sauce and various toppings, such a sliced pork, dried seaweed and green onions. The instant version, which you can find at most Korean grocery stores and which made up a big part of my diet at the apartment during the month, seems to be much more meal worthy than its American counterparts. I found a package that wasn’t too spicy to which I would add some fish, mushrooms and other vegetables before finally cracking an egg in. It was truly delicious. Kimchi jigae is a stew made with kimchi and various other ingredient, like onions, tofu, pork or seafood. It is one of the most common stews here. I had the chance to taste this delicious stew when I was invited to share a meal with Koreans who were on vacations at Jeju Island. Dakgangjeong, Korea’s take on crispy fried chicken, seems to be a traditional after hours meal. I had it on many occasion while in this beautiful country. It is often offered in various seasoning, either dry or sticky tossed in a sauce, and coupled with beer. The most memorable time was during a late evening when I shared take-out fried chicken and beer with Koreans who were staying at my hostel. Reminded me highly of good times had around shared nachos platters at bars back home. This delicious street food has left me hunting for it since the first time I tried it. It was recommended by the American couple who hosted me in Busan. I finally had my first taste of it when I victoriously found it at the traditional market around the Jagalchi area in Busan. It is a small pancake stuffed with brown sugar, nuts and cinnamon. It is then fryed on a greased griddle. A real treat that reminded me loosely of beaver tails back home. Yum! Soju is the most well known alcohol from Korea. It has a high percentage of alcohol and is quite cheap. It reminded me somewhat of sake. One way to drink it is to mix it with beer or soda (similar to Sprite). 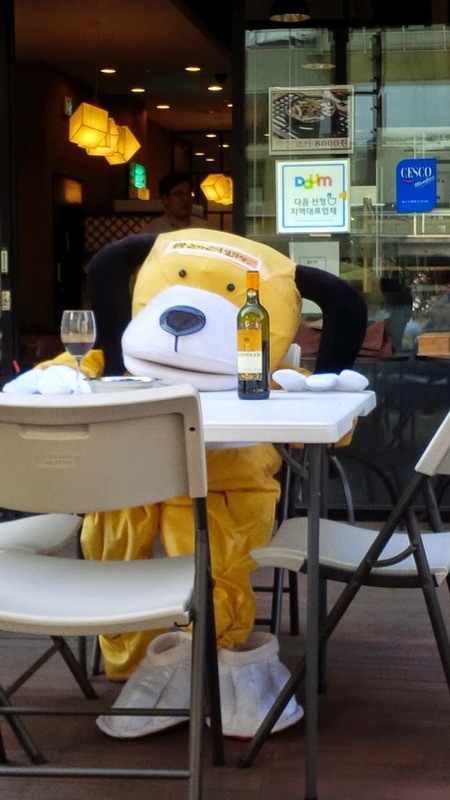 Normally, you put a little soju and dilute with your other drink. Koreans I was with joked that as the evening goes on, the proportion tends to shift. Soju is extremely tricky as it doesn’t taste much and you don’t tend to feel its effect until you try to stand up. Notice the use of “try” here. Definitely stay on the safe side the first time you consume this, or you might just have to sit down for a while to let it pass. 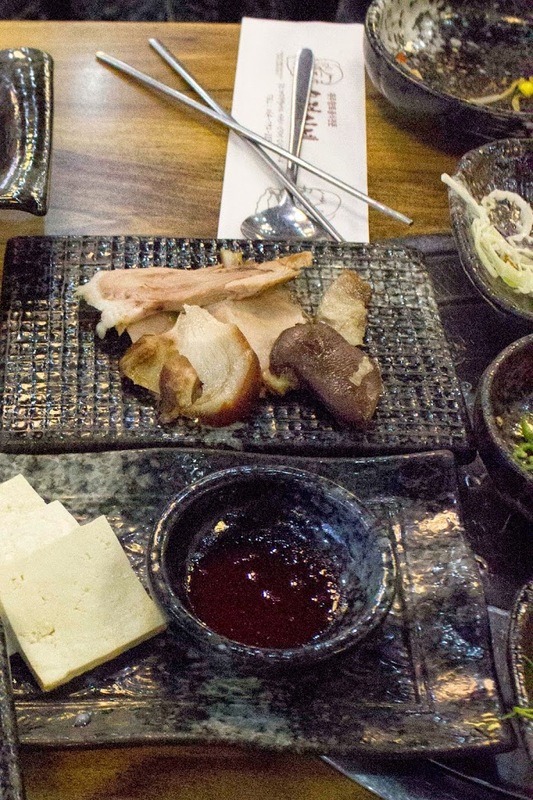 I tasted makgeolli on Jeju Island and have failed to find it elsewhere, much to my dismay. It is a rice wine the color of milk, that has a sweet and tangy taste. Being unfiltered, it contains lactic acid and good bacterias found in yogurt as well as some vitamins and fibers. Plus, its alcohol content is closer to that of a beer than of wine. It’s refreshing and a much safer option than the tricky soju if you like to keep your senses about.